As the Lower Division Clerk (LDC) exam rank list is scheduled to get published in March 2015, the Kerala PSC has decided to undertake the proceedings to include the names of the selected candidates in the probability list. As per latest information, the LDC probability list will be published on 30th October 2014. Even though, the date of publicizing the list was proposed on 15th September, due to technical errors, the procedure got been extended. 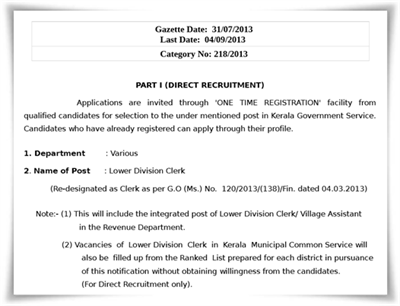 The Lower Division Clerk exam (category No: 218/2013) for all districts (Thiruvananthapuram, Kollam, Pathanamthitta, Alappuzha, Kottayam, Idukki, Ernakulam,Palakkad, Thrissur, Malappuram, Kozhikkode, Wayanad, Kannur and Kasaragod) was conducted from 9th November 2013 to 22nd February 2014. After the publication of the probability list on 30th October, the certificate verification will be held from 27th November which will be extended up to February 2015. Those who find their name in the probability list should have to upload certificates scanned through their one time registration profile. Next to the final process, the main rank list will be published on 31st March 2015 for all the 14 districts. As the validity of the current rank LDC list come to an end by 31st March 2015, the new rank list would come to effect from the date. The probability list will consist of 25,000 persons from all 14 districts. 3000 candidates are expected to find their place in the list from Thiruvanathapuram while 1000 each would enter the top list from Idukki, Wayanad and Kasargod districts. Along with the main rank list and supplementary list, a special list for Physically Challenged candidates can also be expected to get published at the official website of Kerala PSC. With a pay scale of Rs 9940 – 16580, the list of selected candidates published by the PSC will remain in force for a minimum period of one year. 3% of the vacancies reported shall be reserved for the appointment of physically disabled persons. The upcoming rank list of Last Grade Clerk will truly pave way for many youngsters to get a job with the state government.